Live life a little more on the edge with these quality audio products for your boat, motorcycle, ATV, and UTV. Each product is designed specifically to be durable and last in the harsh and rugged environment. For 25 years and counting, Stillwater Designs founder Steve Irby and his engineers have strived to out-perform their competition. Kicker and SoundGate are two divisions under the Stillwater Designs name. Kicker Audio is a high-end manufacturer of mobile, marine, and home/portable products. 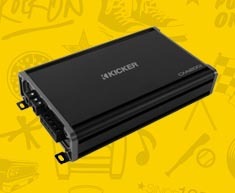 Kicker often refers to these categories as car audio, power sports, and their home and portables. 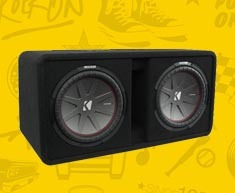 The revolutionary team at Kicker invented their trademark Solo-Baricsquare sub design and constructed the first full-range speaker enclosure specifically designed for automotive use. SoundGate joined the Stillwater Designs/Kicker team in 2006. They are a manufacturer of mobile audio interfaces, as well as OEM integration products. SoundGate provides a quality solution for integrating aftermarket mobile audio products into a factory vehicle. Both Kicker and SoundGate are among the leaders in the car audio industry and manufacture high-end audio components. 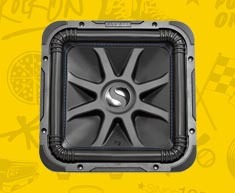 The Kicker car audio products are the core to the Stillwater name and have been since the founding of the company. Kicker released the world's first square subwoofer. Since its original release, Kicker has gone on to develop other square subwoofers such as the Solo-Baric L7, L5, and the award-winning competition Solo-X. Other notable subwoofers from Kicker include the powerful CWR (Comp), the small-box Solo Classic, the loud CVR (CompVR), the shallow CVT (CompVT), and the affordable Comp subwoofer. 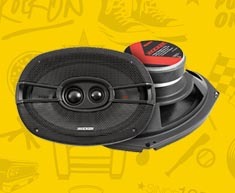 Kicker has also provided an entire line of car speakers to suit everyone's different needs. The DS, KS, CS and D series of speakers provide an entire range of speakers, from the entry-level aftermarket speakers to the high-end competition grade speakers. Kicker is also a manufacturer of quality amplifiers to power their speakers and subwoofers. 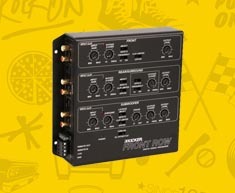 The KXM, CX, and PXA amplifiers are all true to rating amplifiers engineered to provide the most power to the components. Car audio installation accessories are another potion of the Kicker product line. Kicker makes cables, wires, interconnect, distribution blocks, fuse holders, fuses, and many other accessories that are required for the installation of car audio systems. Any product that has the Kicker logo on it can be trusted to provide the highest of quality and satisfaction. Keep checking back to see the latest in Kicker products! Each year they release more products to enhance the audio quality of our lives. They truly live up to their motto: Living' Loud! Follow this link to shop all our KICKER products!